"Bought to use for pizza instead of my antique frying pans. Did eveything the same as always but the pizza stuck really badly. This may be " pre..."
"Wonderful buying experience, fast shipping, good communication and competitive pricing." "Mom and I tried it out this weekend making cookies and it worked GREAT. It cooked evenly and it didnt burn the bottom of the cookies like the reg..."
"Bought to use for pizza instead of my antique frying pans. Did eveything the same as always but the pizza stuck really badly. This may be " pre seasoned " but do not confuse that with a really well seasoned old frying pan. Will go through seasoning procedure and try again but so far a disappointment." Quality product and excellent customer service. "Mom and I tried it out this weekend making cookies and it worked GREAT. It cooked evenly and it didnt burn the bottom of the cookies like the regular non stick cookie sheet right with it. Best of all it didnt stick unlike the so called Non Stick cookie sheet in with it." 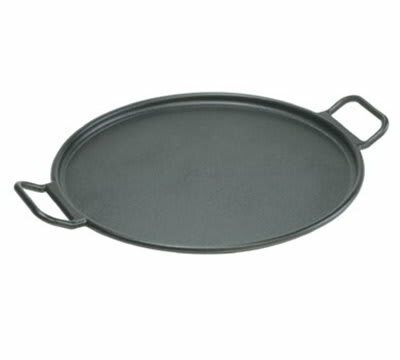 "When I first recieved this I used it as a griddle, makes beautiful grilled sandwiches, pancakes and jumbo crepes. Then I came across a pizza recipe that suggested that cast iron was much better than a pizza stone (they take forever to get up to temp. and the cast iron only takes about fifteen minutes) I've done two perfect pizzas, the crust is crisp on the outside while still tender on the inside! Perfection! Lodge has been a mainstay in my family since it first came on the market and i still have my great grandmother's skillet and i still fry chicken in it....yum! Thanks Lodge for your standard of quality!" "I would like to try it as a kitchen chalk board, but don't want to damage it as a cookware piece!" "I bought this pan only to make pizza and I have to say it was a great purchase. I made the pizza from scratch and the results were spectacular, the crust cooked evenly and it only took 15-20 minutes. I later tried the pan to roast vegetables on the grill and again the results were amazing. This cast iron pan is worth it's weight in gold."